One of the best ways to determine how well a trading strategy will perform is by backtesting. Backtesting is a vital component of the development of an effective trading system. Backtesting uses historical market data to reconstruct trades that would have taken place in the past using rules set by a given strategy. As a result, backtesting offers statistics that help traders determine the effectiveness of their tested strategy. Backtesting is a very popular strategy among traders due to its simple and straightforward approach. Traders who apply this technique believe that past performance is indicative of future results. What Are The Benefits of Backtesting? Backtesting trading strategies can help traders build confidence in a certain strategy before launching it in the current market conditions. Knowing that a strategy has proven to be successful in the past will ignite more confidence that it will work successfully in the current and future market scenarios as well. With the right automated trading software, nearly any trading strategy can be backtested, creating an endless amount of opportunities. 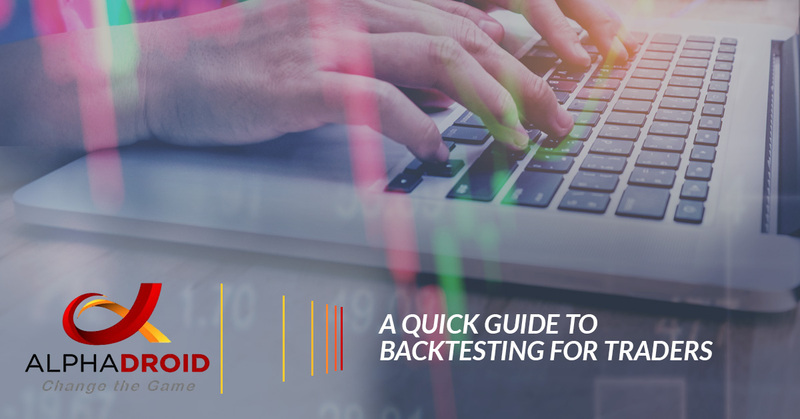 Before traders dive in and get into the process of backtesting their trading strategies, there are a few key points that need to be considered. The Past Doesn’t Always Apply To The Future. Since backtesting uses historical market data, the results achieved in the past may not be the same in the future. The trading market is extremely volatile and can fluctuate at any given time which can affect the performance and statistics resulted of a backtested strategy. The Results Are Not Always Exact. 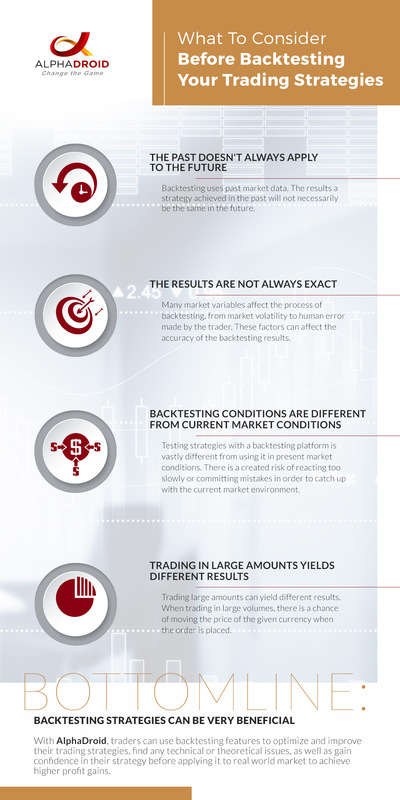 There are many factors and variables in the trading market that can affect the process of backtesting. Use of different spreads by different traders can potentially affect the results. Additionally, market volatility can significantly affect the results of backtesting because, even if you use the same strategy, two different market conditions will generate different results. Lastly, another factor affecting the outcome of backtesting is whether it is performed by a trader or if it is done algorithmically. Using algorithmic trading will definitely produce fewer errors as compared to the testing performed by a trader. Backtesting Conditions Are Different From Current Market Conditions. Keep in mind that using a strategy in present market conditions is vastly different from working with historical data. There is also the risk of reacting too slowly or committing mistakes in order to catch up with the current market environment. Trading In Large Amounts YIelds Different Results. Trading large amounts can yield different results each time. Plus, when a trader goes in for larger trade volumes, there is a chance of moving the price of the given currency simply when the order is placed. Despite these slight issues, if done properly, backtesting can be a very effective strategy. Backtest Strategies With AlphaDroid’s Investment Portfolio Management Software! If you are interested in backtesting your trading strategies, then you need AlphaDroid, one of the leaders in investment portfolio software. In addition to backtesting capabilities, AlphaDroid is equipped with Forward-Walk Progressive Tuning helps create an idea of how a strategy will perform down the road. With our investment portfolio management software, traders can optimize and improve their trading strategies, find any technical or theoretical issues, as well as gain confidence in their strategy before applying it to real-world markets. If you are interested in learning more about how AlphaDroid can increase your success as a trader, contact us today or start your free trial of our investment portfolio software.